The Pet Parade is BACK! Canines dress to impress and march in the shadow of the Washington State Capitol Building at this festive community event. With a different theme each year, in 2015 four-leggers will appear as fairies and owners are encouraged to do the same. A fun and free community tradition for the whole family, no prior registration is required to spectate or participate. Best costume medals are awarded following the parade. 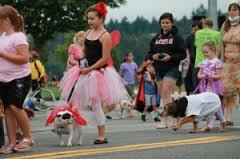 The fun begins at 10 a.m. at Capital Lake’s Heritage Park, 301 5th SW Avenue in Olympia. Watch for updated information at www.theolympian.com/petparade.